Temperatures have dropped, and it feels like we've jumped from Summer to Autumn almost overnight. The males and females tank dropped from 19 and 20 degrees to 14 and 15 respectively in just a couple of days. The females tank was event higher for most of September, because I was heating the females tank up to a week ago to help a new fish get over a couple of knocks and to help mature a new batch of filter media. It was languishing at 24 / 25 degrees through September and into the beginning of October. 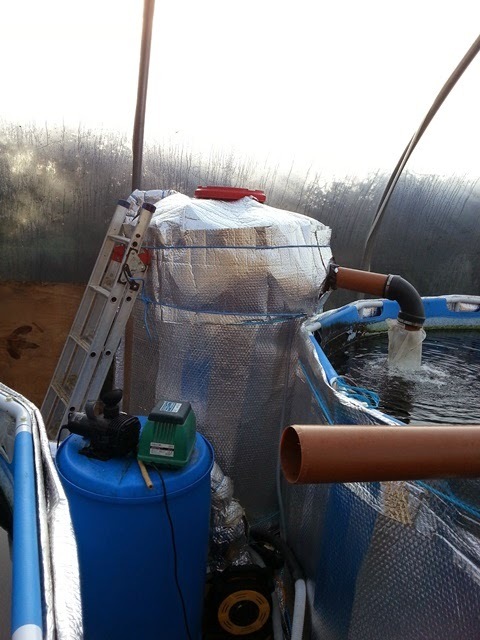 But the tank isnt set up for being kept warm and once the ambiant temperature took a dive, the heating couldnt cope. The fish seem fine, and all the females have benefited from the elongated warm period, putting on bulk for the winter and perhaps a little length too. I run my main brood fish tanks ambiant most of the time, and I'm not too worried about the temperatures dropping. The fish are all looking really good, apart from one male which knocked a scale a few weeks ago which is taking some time to repair. The cooler temperatures will slow that repairing down a bit, but overall I'm happy with the state of play going into winter. After such a good year, next year's spawning season can't come quickly enough. I've been re-jigging my brood fish; I've sold the female showa that didnt produce many eggs - she's a stunner, but eggs are her main purpose for me! And I moved on a male showa that does the business, but fertilisation rates were low both times he was in action - which isnt good enough. the money in helps me fund new purchases. The varieties I am focussing on remains unchanged. I want to continue with Kohaku next year and try some different breeding combinations, but the one thing I didnt achieve this year which lingers a bit is producing some showa or shiro fry. I am all set up to do that - with 3 shiro females and 2 showa females; albeit, only the shiro females have a track record of actually spawning. I have sufficient showa males, and enough to have a good crack at shiro - so watch this space. In the polytunnel, it's clean up time! Plus, keeping up with maintenance on the fry growing on tanks. The early summer keepers are romping away. The late summer keepers have take a bit of time to start growing after second selection but they're on their way now and doing really well - I may take them up to 4 inches before the next selection which should be in a few weeks. 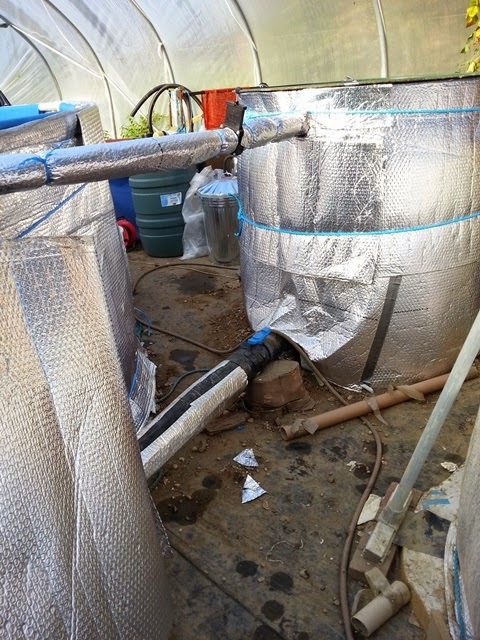 I'm heating these tanks, and my heater hasnt been able to cope with the cooler conditions. 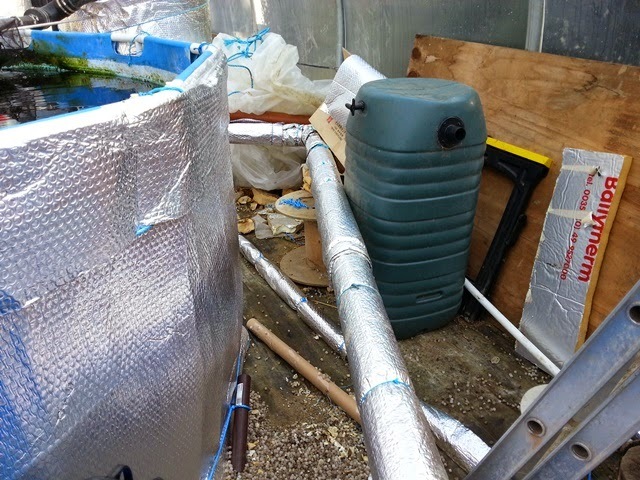 So, I've been adding insulation and I have bought a new air source heat pump; a really beefy one that should help me keep both growing on tanks in the low 20's through the winter. The late summer kohaku keepers are an intriguing prospect. They are developing in a different way to the early summer kohaku's and I'm not sure whether this is due to different growing conditions only, or whether the different male genetics in the brood set has made the change. It may take me a few years to work that though, but for now - I'm just happy there are lots of pretty ones there and I will have a closer look at them at the next selection. Next step is to cover the tanks. Not ideal, but it helps hold those temperatures in. And finally - I took pictures and a range of measurements of all the early summer keepers when I had them netted up a couple of weeks ago. I'll hold those in reserve and when I pull them out next, we can do some comparisons.